Netflix has described 4K as "the format for the Internet" and with precious few other outlets for Ultra HD it's pretty easy to agree. Slowly but surely, the SVoD giant is adding UHD content to its line-up, most recently a couple of movies and box-set poster boy Breaking Bad. That compares to just 15.6Mbps currently used by Netflix for the Ultra HD content on its nascent streaming service. Meanwhile, the UK's average broadband speed is 17.8Mbps but that Ofcom number is worked out using quoted speeds, not actual ones. 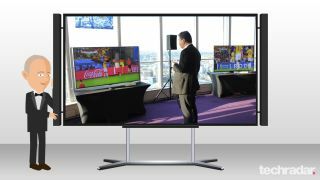 A BBC spokesman told TechRadar that delivering high frame rate UHD sport is much harder to encode than library content which can be massaged to fit a smaller broadband pipe. The implications of this could be huge. While broadcasters in the UK and abroad continue to play any 4K plans close to their chest, previous form suggests that live sports will be the key driver for 4K channel plans, and it's increasingly looking like satellite will be the only way to effectively deliver high frame rate live UHD, not least because pretty much anyone can erect a dish to get it (planning permission not withstanding). 4K could flip from being the format of the Internet to the format of the dish overnight. Of course, it could equally be argued that 4K will ultimately be the format of the home videographer. I've been playing Sony's FDR-AX100 4K camcorder, and the results look so stupefyingly good, only a complete lack of film-making talent prevents me from home brewing all my own content. Admittedly, a channel consisting primarily of cats misbehaving and shrubbery may not sound overly captivating, but the amount of detail captured by the AX100 is simply mesmerising. Playback revealed details I was oblivious to when shooting; the all but invisible lace of a spider's web looked stunning, while the veined wings of a passing fly had eerie beauty. It was if I had suddenly turned into Ant-Man. The AX100 camcorder shoots 4K in XAVCS format, in 30p/35p. It can also record in XAVC S HD or AVCHD at the same time for easy file sharing, but be mindful though that UHD file sizes are reasonably hefty. A 64GB SD card will only get you 130 minutes of footage. The ability to record your own 4K content looks likely to expand rapidly, as pocket cameras begin to offer the functionality. If a system camera is more your style, then Panasonic's GH4 will shoot comparable 2160p. The GH4 encodes its UHD in h.264 MPEG-4, again with frame rates capped at 30Hz/fps. Compared, footage from both is remarkably similar in overall fidelity. On a large screen 4K panel even the most mundane sequences have depth and surprisingly beauty. And of course, being UHD you can take your home brew footage cinematically large. I ran my Sony 4K b-roll through the brand's top of the line VPL-VW1100ES 4K projector (a snip at £18,000 or thereabouts) onto a 120-inch screen. The results looked incredible. 3840 x 2160 resolution scales in a way that no consumer format has ever done before. Any bets on when You've Been Framed will get a UHD upgrade?